Marilyn Sarelas, 71, of Portland, Maine, joins a crowd of demonstrators protesting the nomination of Brett M. Kavanaugh to the U.S. Supreme Court at a Thursday rally across the street from the Portland office of Sen. Susan Collins (R-Maine). Good morning from Augusta, where a new survey of Maine voter opinions by a national political pulse taker shows a swing in support for Maine’s senior U.S. senator. A key October vote on the latest Supreme Court nominee solidified support among Republicans as Democrats expressed disgust. After U.S. Sen. Susan Collins, R-Maine, became the controversial deciding vote to confirm U.S. Supreme Court Justice Brett Kavanaugh, who was alleged to have sexually assaulted Christine Blasey Ford, many wondered how that decision would affect her political standing among constituents, specifically Democrats. A new Morning Consult report gives us a bit of insight. Morning Consult polled 945 registered Maine voters between Oct. 6 and Nov. 6, then compared those results with what had been collected from more than 2,000 Maine voters between July 1 and Sept. 25 for its third-quarter update. Approval ratings now should not be perceived as a clear indicator of her re-election chances. Barring major shifts between now and 2020, when Collins would be up for re-election if she chooses to run again, her Kavanaugh vote reduces the likelihood that she would face a serious primary challenge from the right. While her vote against repealing the Affordable Care Act and her general support for abortion rights have irritated some of Maine’s more conservative Republicans in the past, her status as the party’s most influential office holder remains unchallenged, especially as Gov. Paul LePage is preparing to leave office — and the state. But sustained disapproval from independents and Democrats could create problems in the general election, especially if voters are mobilized to repudiate President Donald Trump and fellow Republicans. While this drop in approval may seem substantial now, it’s unlikely to sustain itself long enough to stymie her chances if she runs for re-election, but it could make her path harder. From 2008 to 2014, her margin of victory broadened from 23 points to 36 points, in part because she secured votes from left-leaning independents. In essence, the Morning Consult survey confirms what we expected. 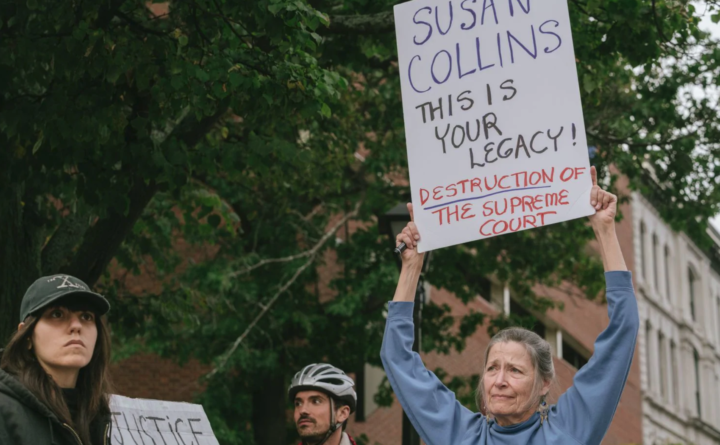 Collins won back support from some Republicans who had drifted away, probably nudged by past LePage criticism of her moderate stances, while she angered Democrats and voters who probably would have been unlikely to back her in 2020 anyway. The demographic to watch during the next two years will be independents. And while it’s fun to speculate about future elections, it is little more than a fantasy league exercise until we have a clearer picture of which Democrat would oppose her in the general election. With Janet Mills’ win in the governor’s race on Tuesday, Democrats have now at least broken their 12-year losing streak in statewide elections. But whether the strategy that propelled them to that win can be adapted to a serious challenge against Collins remains to be seen. Newly elected Maine senators picked their leaders. Republicans, who will drop into minority status in the 129th Legislature after four years as the upper chamber’s majority party, chose Sen. Dana Dow of Waldoboro and Sen.-elect Jeff Timberlake of Turner to be their leaders. Democrats said that Sen. Troy Jackson of Allagash was running unopposed in their caucus to become Senate president and Sens. Nate Libby of Lewiston and Eloise Vitelli of Arrowsic ran unopposed for majority leader and assistant majority leader, respectively. A former Maine legislator was found guilty Wednesday of stealing $3.5 million from two elderly widows. Robert Kenneth Lindell Jr., 53, of Cloverdale, California was convicted of theft by unauthorized taking, a securities violation in connection with the alleged fraud, three counts of theft of federal income tax funds, and five counts each of intentional evasion of income tax and failure to pay Maine income tax. The former legislator from Frankfort has requested a new trial and will be held in Penobscot County Jail while he awaits sentencing. A Bangor Republican won two elections this week. After securing a seat on the school committee, John Hiatt learned Thursday that he had apparently eked out a win over incumbent Democrat Dan Tremble to win the county treasurer’s race. “I didn’t think I was going to win, but I had faith in the Republican Party’s turnout,” Hiatt said Thursday. Tremble was first elected to the post in 2006 and is serving his third term. He ran for the position unopposed in 2010 and 2014. Tremble won in Bangor and most surrounding towns, but smaller, more rural towns voted for Hiatt. Here is his soundtrack. A state ferry fee hike that angered islanders will get a second look. After the Maine Department of Transportation adjusted its rate structure for ferries to Maine islands, the residents of Islesboro rebelled, taking the matter to court amid arguments that the fee changes unfairly burdened them. That legal fight is now on hold as state transportation officials have agreed to go through another rulemaking process that will invite more public comment on the ferry rate plan. A Massachusetts great-grandfather this week collected a $100,000 prize he won by playing uniform number of five members of the World Series champion Boston Red Sox on a lottery ticket. Jim Aylward Jr., 84, won the prize by playing the numbers of Red Sox players Rafael Devers, Andrew Benintendi, Jackie Bradley Jr., Rick Porcello and World Series MVP Steve Pearce. What an uplifting story and appropriate way to keep reminding people — especially Yankees fans — that the Red Sox and winning are a matched set. But it also spurred me to think about how uniform numbers could be used to promote good in other places. How about giving each new legislator a team jersey on the day that lawmakers are sworn in? They already have a number — from their district — so why not give them a jersey along with the license plate that displays that number? Wouldn’t that be a gentle, productive way to promote bipartisanship? The Legislative Council could pick a nice neutral color scheme — no reds or blues — and each lawmaker could receive a numbered jersey with a color pattern that reflects the fact that, despite ideological and geographical differences, they are all on the same team. The symbolism might build goodwill in each chamber and send a positive message to constituents and the other branches of government. Of course, the House and Senate would have to have different jersey colors so we can sort out winners from losers after the annual fishing tournament. Because Monday is a federal holiday to observe Veterans Day, we will not publish Daily Brief. We will return on Tuesday, Nov. 13. Thank you for your service. Today’s Daily Brief was written by Alex Acquisto and Robert Long. If you’re reading this on the BDN’s website or were forwarded it, click here to receive Maine’s leading newsletter on state politics via email on weekday mornings. Click here to subscribe to the BDN.